This is one of the simplest recipes I have on this site, and it’s great! I probably end up having it 2-3 times per month, despite the incredible variety available to the Paleo eater. 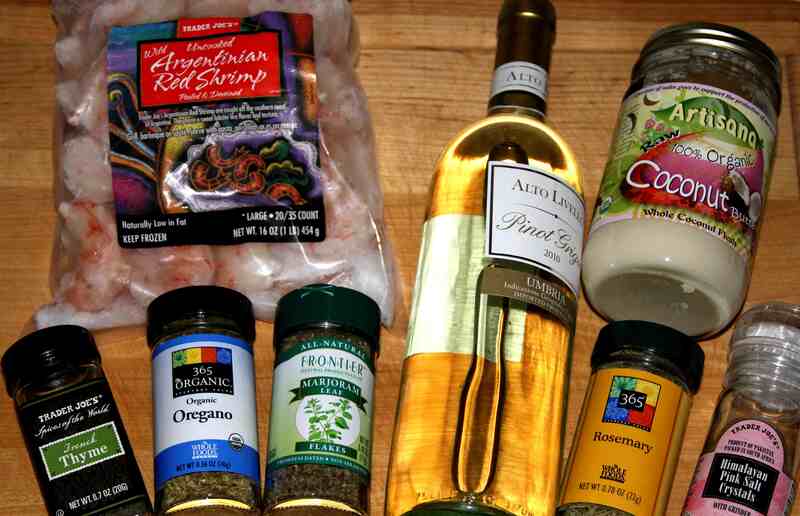 First, put the shrimp and 1 cup of your choice of white wine in a large skillet or frying pan. Put this on high heat, and bring to a boil, stirring occasionally. Once it’s at a boil, add the second cup of white wine. Again, bring it to a boil, stirring occasionally. Now add all of the other ingredients: The 6 tablespoons of coconut butter (no, you cannot substitute for coconut oil in this recipe), the salt, and the spices. Turn the heat down from high to medium-high, or about a 7. Stir occasionally, until the remaining liquid is below the level of the shrimp. At this point, you should begin to stir nearly constantly. The shrimp is done when all of the ingredients in the pan now stick to the shrimp, coating them in the spiced wine and coconut butter reduction sauce. Serve this hot, and eat it immediately. This dish is just too good to let sit around and cool off. Enjoy adding other urbanpaleochef recipes to make a full Paleo meal!